This authentic sailing cruise to Indonesia on tall ship Star Clipper explores the breathtaking Komodo National Park and beautiful islands scattered off the coast of Lombok. Discover the natural beauty of Gili Kondo, before heading to the island of Komodo in the UNESCO-listed Komodo National Park. 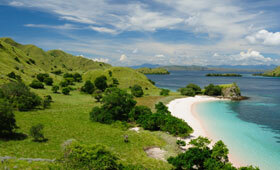 See the Komodo Dragons and relax on the iconic Pink Beach. Satonda Island, formed during a volcanic eruption, and the iydllic Gilis archipelago offer stunning beaches and crystal clear waters, rich in colourful corals and teeming with tropical fish and turtles. Take the opportunity to snorkel or relax and unwind on the white sandy beaches, before Star Clipper cruises back to Bali. Embark Star Clipper in Benoa, Bali. The island of Gili Kondo in East Lombok has outstanding natural beauty, from beautiful white sandy beaches to dense green vegetation. The waters surrounding the island are teeming in fish and colourful corals so perfect for snorkelling. Relax and enjoy the facilities on board Star Clipper. Komodo National Park consists of several volcanic islands, including Komodo, Padar and Rinca. It was set up to protect the Komodo dragon and is now classified as a UNESCO World Heritage Site. As well as the famous Komodo dragons, the park is home to variety of other species, from sea turtles to the orange-footed scrub fowl. Explore the beautiful island of Komodo today, and enjoy a visit to its iconic Pink Beach. Satonda island is located off Sumbawa, and was formed by a volcanic eruption. Perhaps enter the caldera, home to a black lake, or walk through the dense jungle, home to thousands of fruit bats. The waters surrounding this beautiful island are rich in corals and tropical fish, ideal for swimming and snorkelling. Gili Meno is a tiny, unspoilt island. It is possible to walk around the perimeter of the island in a couple of hours. It is the perfect escape with a relaxed atmosphere and just a handful of local cafes. The Gili Meno Wall is the best place on the island to see turtles and Moray Eels. Continue to Gili Trawangen, which has become a popular holiday destination with hotels and stunning beaches. The tranquil island of Gili Naggu is the perfect place to relax and unwind, with beautiful beaches and turquoise waters. Swim, snorkel or sunbathe during your time here. Disembark Star Clipper in Benoa, Bali.